Picture it. A perfect day on the water. Clear skies. Warm sunshine. A slight breeze. And only a few other boaters out to share the sparkling waterways. Aside from a mechanical breakdown or an empty gas tank, what could possibly impede such a glorious day? Here is one potential unpredictable buzz killer: A closed bridge. 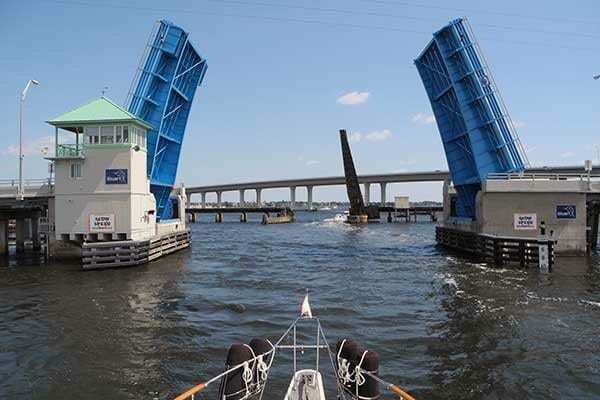 Few unpredictable facets of the boating life can be as frustrating as a closed bridge. Most often, a closed bridge only causes a brief interruption, just enough time for the operator to lower the gates on a roadway and raise the bridge. But the waterways of Jacksonville feature another more challenging potential show-stopper: the railroad bridge. Have you ever been out on the water, with time-sensitive plans, only to discover that blocking your path is a railroad bridge that won’t be opening for hours? You might be able to take some action, beyond just screaming or crying. 1). Before you set off, check your schedule because some bridges only open at set times. It is important to know when that is. 2). You always need to know about clearance. Can your boat fit underneath a bridge without it being raised? Or are you forced to wait for the bridge tender to raise it? Important note: Don’t call the bridge tender until you are in sight of the bridge. They need to see you so they can plan for the best time to open. You can also get the attention of the bridge tender to open the bridge by using a sound signal. Use one prolonged blast (at least 4 to 6 seconds) followed by one short blast (about one second) and the bridge tender will reply with the same signal to let you know that it can’t be open immediately.